Nice, this just broke 1000 views. Here's another screenshot. There are 2 sections left I want to add before I finish this map. If everything goes well I might be able to finish it next month. 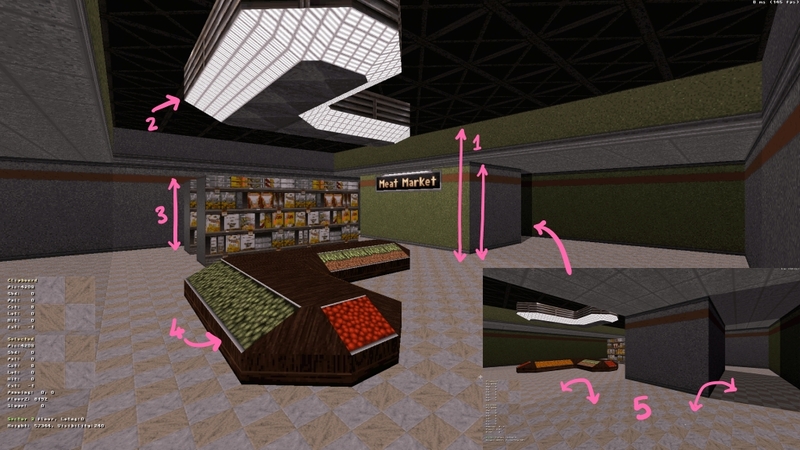 Increase the height of the central section of the supermarket, to create a divide between the cashier section. You could do the same near the fridge area too. Throw in a ceiling texture change to the lower ceiling section. This should remove some flatness and, in addition, extra depth to the scene. After the first change, this could be a nice approach to the veg/fruit stand for lighting, creating a little more ceiling detail. Since the ceiling has been raised, these aisles could also be raised if desired. I also recommend changing the side texture to something different from the walls so it's not overused. I've done a similar thing to the main walls reusing your green-pal version to reduce repetition. Threw this variant of the wood texture on the sides here for trimming purposes (personal preference) Doing stuff like this just helps solidify your decoration and simply feels more polished overall. Created some difference in shading here. 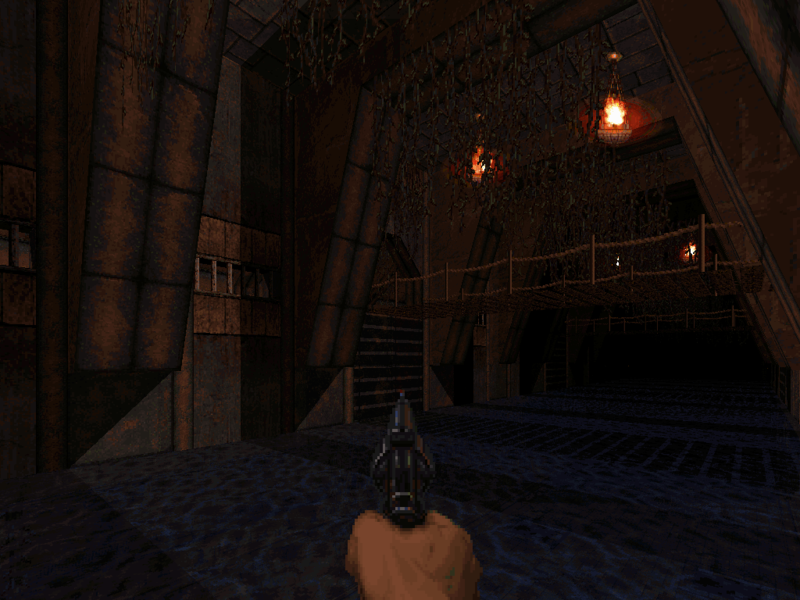 The centre is bright since this area is important and added the darker shading to break up the monotonous lighting, but also helps add extra flavour to the scene. How and where you do apply is of course personal preference. Good luck with the remaining sections! Thanks for the tips quakis. They really improved the room. 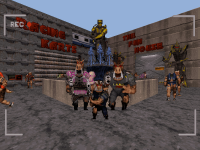 well I am starting to make a mod based off the duke nukem II story in which is actually the prequel to duke 3d. I am only amatuer when it comes to level design but you're free to play the first level I made over night.Iit's not much but I like it, at least love to get feedback on this map I am still in the experimental level design stage. But I can imagine where you want to go with your mod, and I'll probably like it. I've been building some stuff since the end of August..
Hey, it looks really good! I don't remember such stuff from you before! I was going to comment but forgot: you have a few good ideas but I think more details would do the map a favour. Some areas looks really bland there. Haven't been working on anything new for a while, since I've been focusing on World Tour (And Destiny) for the month. 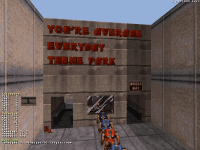 So I finally started a new map, which is gonna be a theme park level. 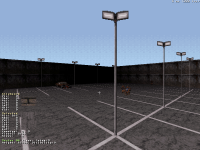 It's not much now, but here's the parking lot which is the starting area. Also remember this area seen in Prison Train? It will actually be part of the level. Are you the Maarten of Maarten Desert? Edit: yes. I really enjoy your map in WoA, one of the best of the pack! Yes, it's me! That's one of my first maps! Trooper Dan's War of Attrition mod. So you could say.. Maarten desert-ed the community for a while. ...I'll leave myself out now. 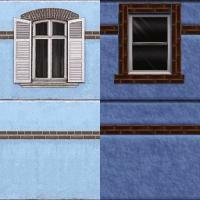 I have just tried to remake World Tour textures. Should I continue and reamke all of them? What's your reasoning behind the remakes, allowing people to play the maps without owning them legally? What makes you think that? You would still have to pirate the map data, and there probably aren't many (any?) ways to download only those without the rest of WT. I assume the idea here is to "do it better". I am going to make new maps. I do not like the original. The idea is... "do it right" at least close to "right". Yeah the textures are terrible. They're Duke! Zone 2 tier. I think I've gotten REAL lazy with the name for the theme park! Honestly, this just makes the texture looks like a generic default Duke3d building. Some people are complaining about the World Tour textures but at least they are not just a recolour like the final boss is. I hope it's a joke. 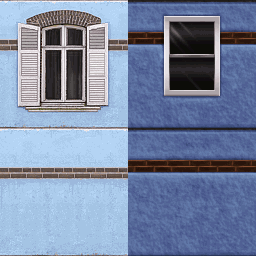 There are some good textures, but most of them are rips from photos without any overpaint. 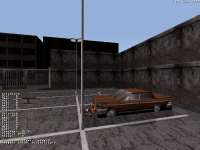 Duke Nukem 3D has an art style which must be kept in official episodes. Look at Birth, it has great textures. Again, I am not saying that my texture is right. I am just making my version of textures and maps. 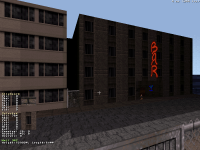 There are a lot remakes of E1L1 and everybody loves them, so I am just making my version of Amsterdam for now. Calling it as "Remaster" is only for hype, as I want get a lot of money and become popular. I also have got a bless from Jimmy, that means a lot. If you are making them for yourself, of course do it the way you want. But my suggestion to get a few more people on your side would be to spice it up a little. My pic is just a very quick cut/paste using your texture and a bevel filter to make the window look recessed in the frame a little. It can be done much better but it gives you a hint as to what I mean.